Open Culture has an article on the popularity of religious groups in the United States. 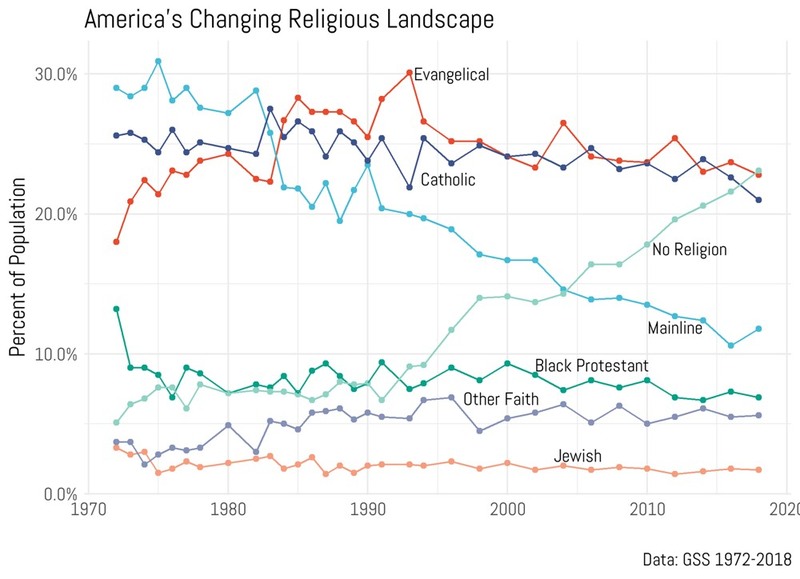 The growth of those declaring “no religion” over the last couple of decades is noteworthy. The reasons given are also interesting. A non-belief in God is only the fourth most popular reason; complaints about religious institutions scores higher. 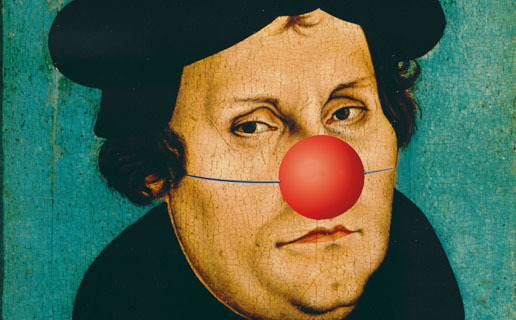 Much of the decline seems to have come from “mainline” protestant denominations. That compares problematically with the evangelicals who tend to vote a lot and as a bloc. 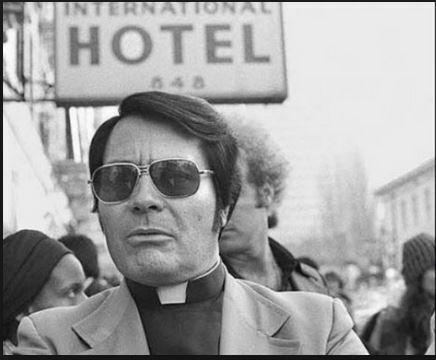 More than half the Jonestown population were women, many with infant children whom they obediently fed kool-aid and cyanide on that last day, forty years ago today. Cyanide takes a few minutes to kill and it is not a pleasant way to go. But if you are ever tempted to romanticize these deaths, perhaps it is best to remember the radical brainwashing needed to bring hundreds of mothers to the extremes of mass murder and suicide. Jones joined the “revolutionary suicide” with a bullet to the brain, his ideas forgotten, his death glorified as a gratuitous cult. 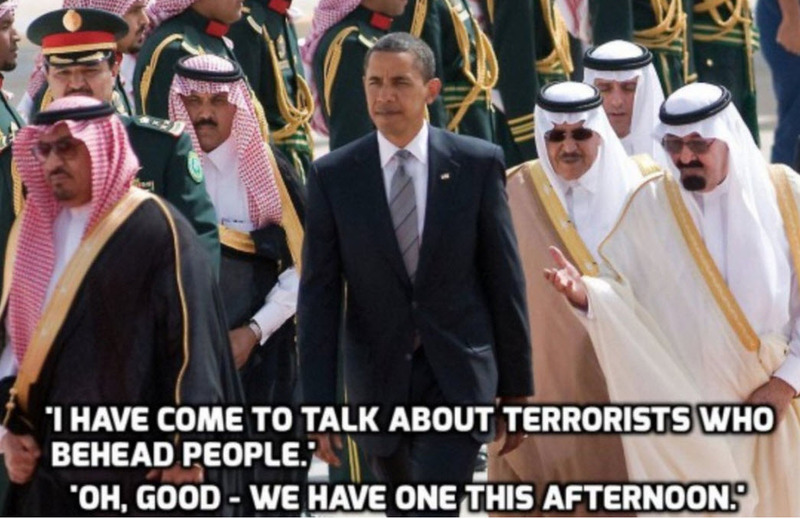 Guns and knives did for several more about whim no-one speaks. Not many survived, not many at all. The people fade into the background, but the event remains. According to Harold Camping, a radio-evangelist who has several millions of followers around the world — enough to send him more than $120 million — the world will come to an end at 6pm on 21st May this year, just a couple of weeks away. 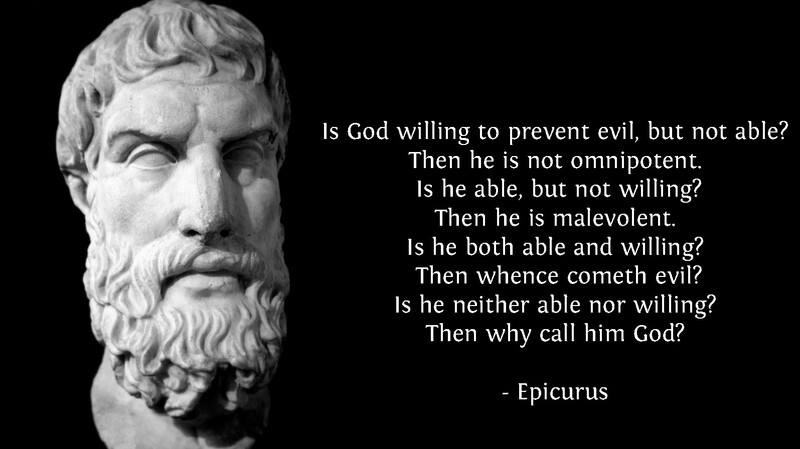 The Reverend Camping knows this because he has mathematically proven the date from multiple verses in the Bible. The Reverend Camping is so certain he is right — even though he was wrong when he made the same prediction in 1994 (“At that time there was a lot of the Bible I had not really researched very carefully,” he said last week. 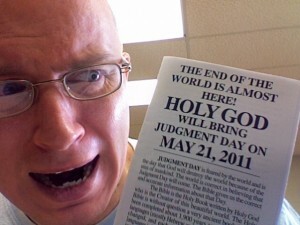 “But now…”) — that he has paid for 2,000 billboards across the States to display his warning of the coming apocalypse. Not only that, he has hired believers to man logoed camper vans in which they drive across all 50 States to push the message. I am neither mathematician nor theologian enough to take on the Reverend Camping’s predictions. But I do recall that Jesus once said that it is easier for a camel to pass through the eye of a needle than it is for a rich man to enter the Kingdon of Heaven. So, as a gesture of friendship — taking one for the team as it were — I am willing to accept all the Reverend’s followers’ money on or before 20th May. It would be terrible, wouldn’t it, to be one of the Chosen and yet still get rejected at the Pearly Gates because you have too much money? Wouldn’t that just be awful? I’m willing to save all his followers from that terrible fate. Send checks or bearer bonds to me c/o my email address and prepare to meet your maker comfortabley knowing that you do so naked of both wisdom and treasure. You will be relieved to know, I am sure, that while surfing the web today I discovered the date that Jesus is coming to judge us all. Judgment Day is May 21, 2011. Don’t go making vacation plans for after that date. Time will have come to an end and you will never get your deposit back. How can I be so sure of the date? Easy — these folks on the Internet (so you know it must be true) told me. They are so certain about it they are renting billboards to let us all know.